Universal access to clean energy is a major worldwide concern which has been reaffirmed when 2012 was declared by the United Nations as the International Year of Sustainable Energy for All. With this goal in mind, multinational corporations are developing inclusive business approaches targeting low-income populations. To be considered successful, these strategies must participate in development, be sustainable, and impact as many people as possible. We describe the case of Schneider Electric’s BipBop programme which aims to promote access to reliable, affordable and clean energy to the people who need it the most. We present key factors contributing to a broader effectiveness of poverty eradication and protection of the environment by multinational corporations: engagement of top management; programme alignment with the strategy of the firm; incorporation of the Groups’ entities; balancing global and local actions; and measuring social and environmental results. L’accès universel à une énergie propre, préoccupation majeure dans le monde entier, est à l’honneur cette année, les Nations Unies ayant proclamé 2012 comme l’Année Internationale de l’Energie Durable pour Tous. Dans cette perspective, les multinationales élaborent des approches d’activité durable destinées aux populations à faible revenu. Pour porter leurs fruits, ces stratégies doivent participer au développement, être durables et concerner le maximum de personnes. Nous décrivons le cas du programme BipBop de Schneider Electric qui vise à promouvoir l’accès à une énergie fiable, abordable et propre pour les populations qui en ont le plus besoin. Nous présentons les principales initiatives des multinationales qui contribuent à une éradication de la pauvreté et à une protection de l’environnement plus larges et plus efficaces : engagement de la direction ; alignement des programmes sur la stratégie de l’entreprise ; incorporation des entités des Groupes ; équilibre entre actions mondiales et locales ; et mesure des résultats sociaux et environnementaux. El acceso universal a una energía limpia es un importante motivo de preocupación en todo el mundo que se ha reafirmado con la declaración, por parte de Naciones Unidas, del año 2012 como el Año Internacional de la Energía Sostenible para Todos. Para lograr este objetivo, las multinacionales están desarrollando planteamientos empresariales integradores destinados a las poblaciones más desfavorecidas. Para ser consideradas satisfactorias, estas estrategias deben participar en el desarrollo, ser sostenibles y llegar al mayor número posible de personas. Describimos el caso del programa BipBop de Schneider Electric, que tiene como objetivo fomentar el acceso a una energía segura, asequible y limpia de las personas que más lo necesitan. Presentamos los factores claves que contribuyen a una mayor eficacia de la erradicación de la pobreza y la protección del medio ambiente por parte de las multinacionales: participación de los altos directivos; coordinación del programa con la estrategia de la empresa; incorporación de las entidades del Grupo; equilibrio entre las acciones globales y locales; y medición de los resultados sociales y medioambientales. 1When it comes to access to energy, the world is paradoxical and unfair. Two billion people on the planet are energy privileged and don’t even question the idea of having energy. On the other hand, 1.3 billion still do not have reliable access to clean electricity . They are at the so-called “Base of the Pyramid” or the BoP. For them, sources of energy – kerosene, flashlights, and wood-based biomass – are polluting and expensive, and endanger health. What is even more unfair is that the poorest people pay the most for energy, compared with developed countries. BoP populations suffer form a poverty penalty as highlighted by C. K. Prahalad . Urban inhabitants in Beijing, Paris, and New York spend from six to eight per cent of their revenue on energy, whereas a person living in an off-grid remote village in India will spend up to 30 per cent for poor quality service . While populations without access to electricity are mainly in Asia (55%) and Sub-Saharan Africa (40%), promoting access to energy is a worldwide challenge. 2Access to modern energy not only improves the quality of life of low-income populations, but also facilitates access to healthcare, education and development through entrepreneurship. The importance of access to clean energy as a first step to encourage development was not a primary focus when the Millennium Development Goals (MDG) were set in 2000. None of the 8 goals directly emphasizes the need to promote access to energy. The United Kingdom’s Department for International Development clarified two years later the direct and indirect roles of energy in helping to achieve the MDGs : energy enables enterprise development, staple foods need cooking, modern lighting allows evening classes and home study, energy services free girls’ and women’s time from survival activities, indoor air pollution is reduced leading to less respiratory infections, cold generation improves medical facilities, irrigation through electric water pumps reduces pressure on the ecosystem, and cleaner fuels reduce greenhouse gas emissions. Access to energy is now internationally recognized to be a basic need and means for development of worldwide populations. To that end, Ban Ki-Moon, the United Nations Secretary-General, declared 2012 as the International Year of Sustainable Energy for All and fixed an objective of universal energy access to be achieved by 2030. 3In this context of international concern, multinational corporations have a role to play. Some of them – utilities, equipment and solution providers - gathered among the World Business Council for Sustainable Development’s Access to Energy Initiative to recognize their role in promoting access to energy for all . Developing pro-poor business approaches within multinational corporations raised 10 years ago. The widely popular “Bottom of the Pyramid” strategies from C. K. Prahalad and “Social Business” concept of Muhammad Yunus led to many initiatives in every sector: SC Johnson in Kenya, Hindustan Unilever in India, Cemex in Brazil, Danone and Veolia Water in partnership with Grameen in Bangladesh, or Lafarge in Indonesia. This dominant enthusiasm faced critiques. Aneel Karnani highlighted the fact that there were no profits at the Bottom of the Pyramid, that BoP strategies were not targeting the poorest of the poor, and that companies should consider them as producers rather than only consumers . More recently, Erik Simanis reaffirmed the importance for companies to focus on their core competencies and their search for profit to make BoP strategies successful . Looking at the energy sector, specific obstacles arise. Christine Heuraux highlights the need for high investments of infrastructures leading to the difficult profitability of business models that are often dependent on subsidies . To be considered successful, BoP strategies need to fulfill three requirements. First, activities must attain social and environmental objectives, thus being relevant in terms of development. Second, models must be sustainable to grow in time. Third, programmes must impact as many people as possible through scalability. 4This paper describes the case of Schneider Electric as an optimistic example in such a sensitive context. The Group launched in 2009 the BipBop programme – which stands for Business, Innovation and People at the Base of the Pyramid – to promote clean energy access for the people who need it the most worldwide. Business, Innovation, and People, respectively, provide investments, create markets to deploy dedicated offers, and support adequate training. Through a description of each pillar, this paper illustrates some established success factors based on the reasserted description by François Perrot of “BoP 2.0” strategies . The progressive incorporation of business approaches aligns this responsible initiative with the overall strategy of the Group. The engagement of top management permits BipBop to benefit from the different operational and business entities of the company to provide sustainable products and solutions. The central management of the programme relies on a decentralized team of collaborators whose role is to adapt actions locally thanks to several partnerships. This balance of global and local actions permitted BipBop to replicate projects in many countries: providing financial support to 6 SMEs in the field of access to energy and job integration; distributing 250,000 renewable energy products; electrifying 30 villages; and creating almost 40 training projects in energy management which trained over 12.000 people. BipBop’s social and environmental results are measured and communicated through the Planet & Society Barometer, the Group’s sustainability scorecard, paving the way toward deepened monitoring and evaluation of impacts in the future. 5As a global specialist in energy management with operations in more than 100 countries, Schneider Electric offers integrated solutions to make energy safe, reliable, efficient, productive and green across multiple market segments. The Group has leadership positions in energy and infrastructure, industrial processes, building automation, and data centres/networks, as well as a broad presence in residential applications. With sales of 22.4 billion euros in 2011, the company's >130,000 employees are committed to help individuals and organizations “Make the most of their energy.” The Group has the technologies and the expertise to address the environmental challenges relating to carbon and energy. In addition, it has a presence in more than 100 countries and already makes 39% of its sales in developing economies. Most of the people lacking access to electricity are living in those regions. 6Part of the company’s culture is to play an active role in the economic development of the communities in which it is present. Schneider Electric Foundation was created in 1998 to promote youth integration through vocational trainings and employees’ sponsorship, and to provide emergency assistance to victims of natural disasters. With the emergence of Corporate Social responsibility, the Foundation’s director was in charge of creating the Sustainable Development Direction in 2002 under the Executive global function “Strategy & Innovation”. One of his first missions was to establish a sustainability scorecard which defined strategic plans in terms of sustainability for the overall activities of Schneider Electric, measured their progress, and reported them to stakeholders. The Planet & Society Barometer was launched in 2005 and was externally audited. Three years later, following the company’s goal to improve its engagement toward surrounding communities and to reaffirm its innovation capacity, Jean-Pascal Tricoire, President and CEO of Schneider Electric, decided to tackle the challenge of energy access through what would become the BipBop programme. Sustainable Development direction inspired from “Bottom of the Pyramid” strategies was made popular by C.K. Prahalad in 2004 and “Social Business” approaches driven by Muhammad Yunus, the 2006 Nobel Peace Prize and founder of microfinance institution Grameen Bank . The people pillar creates trainings in energy management trades for disadvantaged youths in order to promote the local development of long term skills and expertise. 8Investments through the Business pillar, offers through the Innovation pillar, and training through the People pillar began autonomously. Synergies between them have already started, thus increasing the broader impact of BipBop activities. BipBop performance monitoring was incorporated into the Planet & Society Barometer in order to track results and to communicate about progress. Innovation and People pillar objectives have been renewed for the period 2012-2014. They respectively have to provide access to energy for one million households and train 30,000 disadvantaged people in energy management trades at the end of the period. Business pillar monitoring has not been kept under the Barometer. The three-year tracking of its activities would not have been representative because of its longer-term timeframe. 9BipBop works as a start-up. This unique positioning within the Group makes it a transversal programme. The central team of an average of 17 people based in France and India rely on several worldwide operational and business entities to fulfil its mission. It takes advantage of every needed qualification thanks to top management engagement. Three years after its launch, the programme succeeded in balancing support and guidance from the central team, and field projects and learning from a decentralized team of collaborators. 10Looking at the corporate level, the BipBop programme is now clearly in line with the Group’s overall strategy. First, it behaves as a solution provider when combining different products, financial support and training to address the needs of low-income people. Secondly, it focuses on “making energy safe, reliable, efficient, productive, and green” . Thirdly, sales are focusing on new economies and emerging countries. Finally, it strongly emphasizes the need for collaboration through external partnerships. The BipBop programme is an emanation of the progressive evolution of the Group’s responsibility: starting with philanthropy, then building a Corporate Social Responsibility framework, and now moving to enhanced business integration. In this sense, the BipBop programme clearly stands in a logic of “Creating Shared Value” emphasized by Porter and Kramer . 11The synergies built between pillars are paving the way to a systemic approach to tackle the issue of access to energy among poor communities, leading to a sustained economic fabric, improved energy usage, and the development of long term competencies. The following sections describe each of the three approaches. 12Schneider Electric Energy Access (SEEA) fund was created in July 2009 with the support of the Crédit Coopératif and the consulting firm PhiTrust to work as a global sustainable venture capital fund. Its mission is twofold. The fund provides support for the creation and development of enterprises and profitable entities which help the poorest to gain access to clean energy. The fund also sustains the development of entrepreneurship in electricity trades and renewable energies. Alongside its social mission, SEEA has a targeted Return on Investment of 5 to 10%. Therefore, supported companies must have a double objective, clearly identified: generate a strong social added value while remaining profitable. In this sense, SEEA stands in the field of Impact Investment. In France: companies promoting job integration in electricity, targeting fuel poor situations, and working in the field of environmental social housing building. SEEA already agreed to invest up to 100,000 euros in Foncière Chênelet and 150,000 euros in Solasyst. Foncière Chênelet is a real estate developer building energy efficient homes for social housing sector. Solasyst is a job integration company which installs domestic photovoltaic systems. In Sub Saharan Africa and Asia: companies manufacturing, selling, renting or maintaining innovative residential appliances; micro-finance institutions promoting individual appliances; and companies installing, operating or maintaining decentralized rural electrification facilities. Every company is in the field of renewable energy and is focusing on rural or suburban areas. SEEA already invested 100,000 euros in Kayer and 250,000 euros in NICE International. Kayer installs photovoltaic systems and distributes Solar Home System in Méckhé region in Senegal. NICE International builds a network of franchises providing access to energy services, and ICT in Gambia and soon in Eastern Africa (see case study “Investment in NICE International”). 14Promoting local development while mitigating financial risks requires strict management rules. Investments concluded by SEEA range from 100,000 to 400,000 euros for periods of 5 to 7 years. The fund never takes a majority shareholding in order to remain as a support for impact growth while the entrepreneur keeps hands on its activities. SEEA always invest in partnership with recognised players. Previous investments were jointly performed with other impact investment funds such as SIDI, Crédit Coopératif, Rabobank or the Dutch development bank FMO. Other potential investments are being explored with similar partners such as PhiTrust, Investisseur & Partenaire, GVEP or GDF Suez’ programme Rassembleur d’Energie. 15Schneider Electric took advantage of the new French legislation of 2008 on employee savings schemes to develop a tailored juridical structure. The law imposes listed firms to propose a savings plan “in solidarity” (“solidaire”) with their employees. In order to better engage every employees as well as giving more sense to such a savings plan, the Group built a mutual fund (SICAV) that invest 5 to 10% of its assets into the SEEA fund. The chosen condition for the savings plan to remain “solidaire” is that SEEA invests a minimum of 35% of its assets into French based companies labelled “solidaire”, officially recognizing their affiliation with social economy according to French law. In 2010 and 2011, 2,000 employees of the Group based in France showed their interest in BipBop by investing a total of over 3 million euros on a voluntary basis into the “solidaire” savings plan. Managing the fund internally is an opportunity for the Group to encourage its employees and business partners around the world to play an active role in the social commitment of the Group. Employees are also involved in SEEA by making the link between the BipBop business management team and energy entrepreneurs that are looking for financial support. Since early 2012, employees have the possibility to provide technical, managerial or accounting support to entrepreneurs through volunteering missions managed by a dedicated NGO, Schneider Electric Teachers. 16Business pillar performance was monitored and reported under the 2009-2011 Planet & Society Barometer. SEEA, through its 6 investments, sustained the creation of almost 400 entrepreneurs onto an objective of 500. SEEA progress tracking has been removed from the new Barometer covering the period 2012-2014. The Group recognized that a three-year monitoring under the Barometer were not the best way to represent SEEA activities which has a timeframe of 5 to 7 years per investment. This removal highlights the willingness to evaluate social and environmental performance in a meaningful way. Access to Information and Communication Technology (ICT) has been recognized to participate to development. Telecommunication networks can provide services that are directly linked with socio-economic development such as entrepreneurship, education, health, agriculture of financial access. However, ICTs need to be leveraged by clean energy. NICE International is a social venture acting in Eastern Africa and the Gambia (Figure 1). Through its NICE-brand and micro-franchise concept, the company already implemented seven ICT services centres in Gambia. 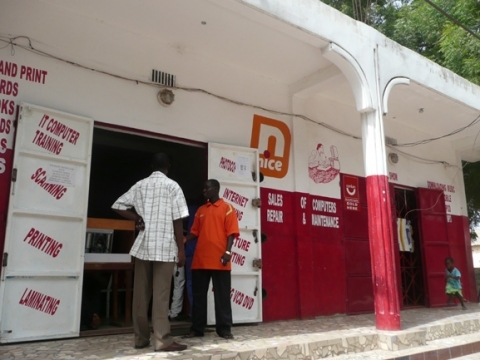 NICE centres are located in peri-urban areas to be accessible by as many customers as possible. The business concept is to sell services made possible thanks to an energy generation point made through a hybrid system solar-grid or solar-genset. All services provided in the NICE-centres are sold on a pay-per-use basis at market-level prices. They are organized into 4 categories, with increasing value to customers: energy services, infrastructure services, value added services, and revenue generating services. NICE centres started to propose energy services such as battery charging of mobile phones and rechargeable household small batteries, servicing solar energy appliances such as mobile phones chargers, lanterns and radios. Infrastructure services are the core offer of NICE Centres. Examples are computer use, Internet-browsing, VOIP-calling, printing, scanning and cinema. NICE International plans to extend up to 250 centres in 10 countries starting with Tanzania and Zambia. NICE has been granted 2.5 million euros by European aid to finance the first 50 centres. In this frame of expansion to serve low-income population, Schneider Electric Energy Access fund invested 250,000 euros alongside with Rabobank and the Dutch development bank FMO which respectively co-invested 250,000 and 500,000 euros. This will also permit NICE International to develop their 2 other categories of services through strong local partnerships. Value added services are focusing on empowering specific target groups such as business development, e-healthcare, e-banking, or government services. The most important service is education. As an example, NICE centres provide services for youth such as access to Internet, computer based education, and school TV for primary schools. Income generation services would focus on entrepreneurs by providing an infrastructure that allows start-up incubation. Small enterprises may be secretarial services, computer-based accounting services, web development (as follow-up of web-design courses) and Internet-trading. 17Innovation for the BipBop programme starts with understanding the local socio-economic context and needs of those with little or no access to electricity. With this in mind, the aim of the BipBop Innovation pillar is to offer dedicated products and solutions that support sustainable economic and social activities through adequate business models that guarantee their sustainability in the long term. As characterized by François Perrot , Innovation pillar activities can be defined as a BoP 2.0 strategy. The market is being created to target a low-income population as consumers and business partners. A team and budgets are devoted to manage local adaptation and replication. Finally, it is important to develop partnerships with NGOs or entrepreneurs to combine capabilities. Portable products: an integrated battery with inverters to plug a CFL bulb and supply small power alternative current appliances. Residential or home products: high energy-efficient LED Solar Lighting Systems (called In-Diya), and Solar Home Systems to supply small direct current appliances such as televisions, fans, or radios as well. Both systems are based on photovoltaic electricity generation to recharge their battery. In-Diya may also be supplied by main grid. Collective solutions: solar or grid supplied battery charging stations meant for In-Diya batteries, solar water pumping system (called Water of the Sun), and solar micro off-grid facilities (called Villasol). 20Residential and portable products have been designed to remain relatively affordable for BoP populations. Looking at In-Diya solar lighting systems, the company supported all upfront capital costs covering marketing and socio-economic studies, R&D of a dedicated product, the set up of a production line, and logistics. In these cases, investments were all supported internally. The distribution of such products present a relatively short return on investment. Even if the creation of dedicated distribution channels requires business developers to adopt new mindsets, it still means partnering with intermediaries as in a traditional Business to Business approach. As of December 2012, more than 250,000 residential and portable products were sold mainly in South East Asia and Sub Saharan Africa. Critical challenges to expand the deployment of residential and portable products rely (1) in last mile delivery to guarantee physical access in remote places, and (2) in payment facilities to overcome financial access barriers. Working with local non-traditional partners (NGOs, cooperatives, entrepreneurs, SMEs, etc) is mandatory to fine tune the distribution based on their knowledge of local specificities and their presence in remote areas. Dedicated partnerships with Microfinance Institutions that create line of credits for energy appliances help end users to purchase products. 21Selling products is not the sole approach to adapt to local context. In some places, it is more relevant to re-evaluate the value proposition by providing services instead of selling products or even kWh. A network of franchise entrepreneurs can propose services such as battery charging, water pumping, grain milling, or times of entertainment through a pay-per-use transactional model (Sireau, 2011). The BipBop team’s role is to accompany small recognized entrepreneurs living in the communities who are thus closer to end customers. In the case of In-Diya Solar Lighting Systems, an entrepreneur manages a battery charging station. He sells or rents the lamp only, decreasing the price for end-customers compared to the acquisition of a complete kit. He then progressively reimburses his initial investment by renting charged batteries on a daily basis. In such a model, investments are transferred from end customers to entrepreneurs. Critical challenges to ensure the sustainability of such models rely on the appropriate selection of entrepreneurs, the insurance for them to earn sufficient complementary revenue, and a continuous relationship management from the BipBop team. This model is being implemented in 8 states of India, with a network of 200 entrepreneurs (see case study “Entrepreneurs Development Programme in India”). 22Decentralized rural electrification is a major concern for targeting the 85% of populations without energy access living in rural areas . Answering to the diversity of collective, entrepreneurial and domestic energy needs of an entire village requires a systemic approach. Technology providers and utilities need to combine several products and solutions, create local business models, and develop strong projects management in order to be sustainable. As of April 2012, 30 villages were electrified. Nonetheless, a communal solution provision has limitations such as profitability. A critical challenge in the expansion of such models is the necessity to find funding to cover the high investment of infrastructure that cannot be supported solely by electricity tariffs paid by low-income customers. Links with authorities and legal entities are an essential criterion for decentralized rural electrification projects. Because electricity prices and markets are regulated, one needs to obtain government approval to implement a specific project in an area and sell electricity at a specific price. These links may lead to Public-Private Partnerships to complement competencies and share investments. Therefore, including from the early stages of a project the ministries of energy, rural electrification agencies or energy regulation offices at the national level, and civil, religious or cultural authorities at the local level, ensures the long-term viability of projects. In September 2011, Schneider Electric Nigeria inaugurated the electrification of Asore village, the first of a series (see case study “Decentralized Rural Electrification in Nigeria”). 23Started in a CSR perspective, the first projects were mainly pilots to experiment both technologies and business models. The Innovation pillar was then organized to gather and coordinate needed skills and qualifications that a multinational corporation can bring to answer to a BoP issue such as access to energy. Every link of the value chain is impacted by Schneider Electric’s capabilities: the capacity of innovation through mobilization of worldwide R&D, the cost reduction of BoP products through high volumes of procurements, the offer of high quality products that follow manufacturing standards, the supply of products and solutions in every targeted country through internal global logistics management, and the creation of adapted business approaches through a dedicated decentralized team of business developers. The Innovation pillar acknowledges the need to partner with non-conventional actors in order to develop adequate joint actions. Local NGOs, entrepreneurs and SMEs provide a comprehensive understanding of communities and socio-economic contexts. Microfinance Institutions help bypass lack of banking services for end customers, governments and authorities bring legitimacy, set appropriate tariff policies and co-invest in projects. Donors and private investors build hybrid financing schemes to launch projects. 24The top management of the Group set ambitious objectives for the Innovation pillar. Its social and environmental performance has been incorporated under the Planet & Society Barometer since the beginning of the BipBop programme. It permitted to provide access to clean energy to more than a million BoP households at the end of the period 2009-2011. The willingness to scale-up activities has been reaffirmed by renewing the engagement to target one million new household for the period 2012-2014 of the Barometer. Moreover, Schneider Electric’s CEO and three of his Executive Directors included this social outcome monitoring as a share of their yearly bonuses, thus reaffirming their engagement and their willingness for BipBop programme to succeed. Almost 300 million people in India do not have access to electricity. Most of them live in rural areas. To tackle this issue, Schneider Electric through its BipBop programme is building a network of locally based entrepreneurs. They run a Battery Charging Station specifically developed to spread the access to highly energy-efficient LED based lighting systems among poor communities. Entrepreneurs recharge batteries and supply them to people in their village on rent. A local entrepreneur has to own and operate the Battery Charging Station. Schneider Electric India Foundation provides free of cost the first Battery Charging Station kit (comprising 2 75 W panels with module mounting structure, Battery charging station, 10 LED lamps and 20 batteries) (Figure 2). A single kit permits the entrepreneur to have 10 customers to whom he will sell only the lamps at 900 INR (13 euros). Then the local entrepreneur needs to deliver charged batteries and collect empty ones on a daily basis. Charged batteries are rented to customers at 10 INR (0.15 euros). Schneider Electric teams in India select the entrepreneurs that initially benefited from a basic electrician training supported by BipBop People pillar (case study “Vocational training to basic electricity skills in India”). Selected entrepreneurs receive a 1-day complementary training from BipBop team in order to provide them the knowledge to install and maintain the system. They will also learn how to manage their revenues through a basic accounting training. After testing the installation of the Battery Charging Station to be sure the entrepreneurs can start their new business, BipBop teams will manage relationships with them through weekly connections mainly by phone. This ensures to resolve potential issues and to help them to grow their business and start selling other products, hence increasing their revenue. If entrepreneurs want to increase their number of customer, they can either buy a complete new kit for 60,000 INR (less than 860 euros) including taxes, with preferential loans from rural banks. In that case, entrepreneurs reach breakeven after 17 months. Schneider Electric teams in India are identifying partners who would partly subsidize the cost of the kit for the entrepreneur. As of end of March 2012, 57 entrepreneurs created their business of lighting system distribution and battery rental. Their average revenue is 2,500 to 3,000 INR (35 to 43 euros) per month. Each entrepreneur has an average of 9 customers, thus reaching up to 530 people who now have access to highly energy-efficient lighting systems. NGOs managing Electrician Training Programme: Schneider Electric initially partnered with Aide & Action, Don Bosco Tech India, IMC Society of Government ITI and GMR Varalakshmi Foundation in the frame of BipBop People pillar. More than 23 training centres were created to provide 4-months trainings all over India in basic electricity trades. Partners now help to select trainees to become entrepreneurs based on criteria defined by Schneider Electric teams. Such NGOs are key players to maintain relationships with entrepreneurs as they speak local languages. Schneider Electric India Foundation: The Foundation in India provides the initial Battery Charging Station kit free of cost to the entrepreneur, thus helping him to start his activities. The Foundation also provides the pool of resources (trained electricians), thanks to its direct links with NGO partners of the Electrician Training Programme, from which Schneider Electric teams can select the candidates who are most suitable for entrepreneurial activities. Local entrepreneurs living at the Base of the Pyramid: Entrepreneurs themselves are the stakeholder at the heart of the programme. Motivation level of entrepreneurs is the most critical aspect of the program. They stick to the program as it helps them earn additional revenue. Indian team developed a process of “relationship management” under which contact is kept with each entrepreneur at least once a week. In 2009, 4 entrepreneurs were supported to understand the sustainability economic viability of the business model. After 2 years, these entrepreneurs are still in the business and are increasing their customer base. Once, the viability of the model was proven, Indian team decided to scale up the model to 200 entrepreneurs by May 2012 in order to ensure that the model is not geography specific. As of end of March 2012, 57 entrepreneurs in 8 states of India were managing their own Battery Charging Station. A robust process of relationship management is being followed to understand the progress and resolve issues and complaints. As a next step entrepreneur are encouraged to get aligned with our distribution model and sell other products designed for low-income communities. 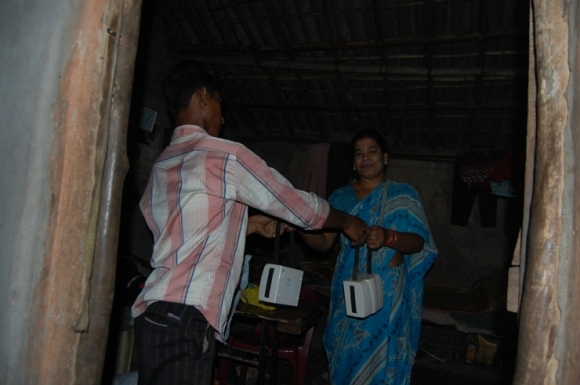 Following the results of a study being implemented in conjunction with the Indian Institute of Management (IIM) Lucknow, to better understand the socio-economic impact of Battery Charging Stations on the entrepreneurs and the village, BipBop programme could decide to increase up to a total of 750 the entrepreneurs supported. Indian teams are now in process of reaching out to other companies, government agencies and NGOs who would like to partner and scale up the initiative. Nigeria has over 160 million inhabitants of whom 60% live in rural areas with few or none having access to energy. By combining the technologies developed in the frame of BipBop and the skills and competencies of Nigerian teams, Schneider Electric electrified Asore community, a village of about 250 inhabitants, in less than 5 weeks combining dedicated off-grid product and solutions. In the Asore community, a lot of time is spent getting water from the closest source. Also, all the activities that require light must be done during daytime, which is a huge constraint. In the framework of its access to energy programme, the Group combined several products and solutions to help low-income people have access to reliable, affordable and clean energy. The electrification of the village is an example of BipBop approach, combining collaboration, local execution and a sustainable business model. The Villasol solution is a standardised solar-powered micro off-grid facility for decentralised rural electrification. It consists of photovoltaic panels, a battery bank and battery charging stations that enable a communal recharge system. In the Asore community, the facility can produce up to 3 Kilowatt; enough capacity to supply domestic, entrepreneurial and community activities such as schools, battery charging station, or water supply for the 90 households, without connection to the national grid (Figure 3). - Fulfilment of the basic households’ lighting needs with In-Diya, a LED based Solar Home Lighting System, for which villagers can recharge battery thanks to a communal charging station at the solar powerhouse. As villagers pay for recharging their battery, they pay more attention to their consumption. Battery rental tariffs have been fixed to allow villagers to save money compared to the equivalent amount of kerosene needed for their previous lamps. A plot of land was donated by the village to house the installation and the community youths mobilized to assist in the project deployment (construction, security, organization). Local technical contractors were pre-qualified, selected and hired to carry out the construction of the power house as well as the purchase, installation and commissioning of the PV panels. Upon completion, the community provides 24 hr security, organizes revenue collection from battery recharge at N50 (0.25 euros) and keeps accounts of revenues for monthly maintenance and replacement of batteries to guarantee the sustainability of the installation. Providing a green end to end solution for rural electrification of an entire village requires high upfront cost investments. For this pilot project, investments were supported by the company itself. Next villages to electrify will be financed through a mix of grants and private investments. The payback of the Villasol installation in Asore is evaluated around 5 years thanks to optimized cabling costs and the battery charging station business model. Schneider Electric Foundation: The Foundation provided the funding to support the up-front investment of the installation and thus testify that such electrification is adapted to Nigerian rural context and needs of its inhabitants. Schneider Electric Nigeria: The local team in Nigeria had a central role of project management. They identified the project, managed its implementation and followed up local suppliers and installers. Once the installation was done, they also conducted an enlightenment campaign to both explain the solutions and provide sensitization on electricity to villagers. Asore community: Asore community represents the beneficiaries of the electrification. There has been a strong involvement of the entire community as the installation becomes their own. The community jointly agreed on the land site to provide for the installation of the solution. Some of the inhabitants provided manual labor during the construction of the small building or the installation of the solution. One of its members has been chosen by the community to ensure the security of the installation, manage collections of funds from battery recharging service and maintain the system on the long run. Ogun State ministry of special duties: Local authorities are key actors which need to be implied from the early stages of such projects. The Ogun State ministry of special duties provided the government support. On the 29th of September 2011, Asore rural electrification project was officially commissioned by the Deputy Governor of the state as well as the Director General of the Energy commission of Nigeria. In attendance also were the Consul general of France, State and Local Government dignitaries, representatives of banks, industries, corporate executives and the company’s partners. About 400 people attended the event; an impressive turnout considering the fact that Asore is approximately a 4 hour drive from Lagos, the nearest commercial city. As a result of this collaboration with the government, 16 more villages have been already approved to receive the villasol systems with funding from the government. Discussions will continue to increase the replication of the model in other villages in Nigeria. Further development of Access to Energy projects could arise, leading to a potential wider involvement in that field for Nigeria. 25A sustained economic fabric and the availability of adequate products and solutions are irrelevant if one doesn’t have the right people to manage them. Without local skills there can be no sustainable development. This is why the role of the People pillar is central to the BipBop strategy. Its objective is to promote the creation of training for disadvantaged low-income populations in the trades of energy management. Competencies and know-how acquired by local trainees helps them to be hired by companies, provide services, guarantee maintenance of systems, and, in time, set up their own businesses. Trainers’ training to support effective and quality dissemination of knowledge transfer in the long run. National governments or the French ministry of education which delegate teachers for training energy management. 28In contrast with the two other axes of the BipBop programme, the People pillar implements projects through donations that can be funding, equipment or competencies. Projects are supported by Schneider Electric Foundation, in the framework of its commitment to sustain professional integration of young people. Local entities of Schneider Electric provide pedagogical materials and their employees train teachers and participate to the construction of curricula. This close link with the Foundation made the People pillar benefit from its experience in implementing local training thanks to 120 volunteering employees that compose the Foundation network of delegates present in 70 countries. The People pillar, as an emanation of the philanthropic history of the Group, was the first to be operational. This early stage maturity allowed the People pillar to implement, as of January 2012, almost 40 training projects in more than 20 countries. In early 2009, the Electrician’s Training Programme (ETP) was launched with the objective of developing skilled manpower in the electrical sector in India. With a helping hand from the NGO Aide & Action, the GMR Varalakshmi Foundation, the institute Don Bosco Tech and IMC Society of Government ITI, 23 training centres are now providing vocational training in electricity for domestic and commercial buildings to underprivileged young people throughout India. The students who benefit from this training are essentially schools or college drop-outs and unemployed. The training courses take place in 23 electrician training centres which are widely accessible in 12 of the 28 states that compose India (Figure 4). Aide & Action is an international Non Governmental Organization having a legacy of providing vocational training for past 30 years. The association and its 1000 employees are conducting educational projects addressing more than 5 million children in 21 countries around the world. In its endeavours to extend the training program to unemployed women in the country, Schneider Electric India inaugurated the first all women’s electrician training program in Chennai in partnership with IMC Society of Government ITI (Women), the Training and Employment Department of Chennai’s Government, women self help groups and several other agencies. Also, partnering with IMC Society of Govt. ITI (Women) is a revolutionary step to empower the women in India to work in the field of electricity. Moreover, a training centre was inaugurated at Hyderabad International Airport in partnership with GMR Varalakshmi Foundation (GRMVF). As a partner, it is a great asset in mobilizing the candidates and imparting quality training to the unemployed youth in India. The trainings take places in 23 electrician training centres widely accessible in the following twelve states in India: Tamil Nadu, Karnataka, Orissa, Bihar, Andhra Pradesh, Delhi, Maharashtra, Meghalaya, West Bengal, Chattisgarh, Jharkhand and Uttar Pradesh. Within the program, unemployed youths from the Base of Pyramid are provided four months of vocational training to enable them to become electrician. All training centres provide a common curriculum based on Electricity for Residential and Commercial Buildings with courses on house and building wiring, electrical safety or solar based home lighting systems installation. In addition to the technical training, the trainees are also given training on spoken English, computers, customer interaction and entrepreneurship. The trainings account for 40 hours per week and 80 days in a year with 30 days of classroom training and 20 days of in-field or on-job training. The certification is provided by the Group and its partners for all the training centres, which help the candidates gain easy recognition from their employers. With the financial support of Schneider Electric Foundation, the Electrician Training Program receives all the equipments and tools required as well as contribution to the payment of salaries of technical trainers. Besides, the program has been supported for the design of the curricula and courses contents to ensure that quality and new market trends are covered. Currently, 11 training centres belong to Aide & Action iLead project; four are managed by GMRVF, one belongs to IMC Society of Government ITI. More recently, Indian team has opened 7 new residential electricians training centres in partnership with Don Bosco Tech India, to encourage entrepreneur development. 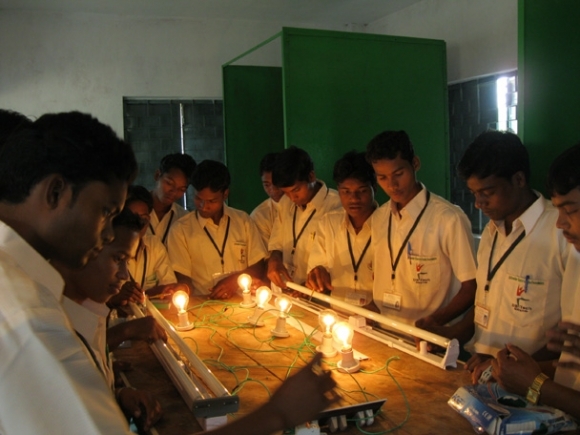 The Electrician’s Training Programme helps nearly 2000 unemployed youth in India every year. 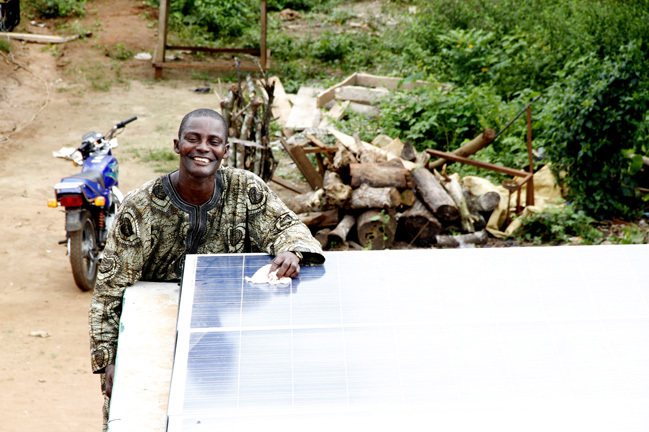 29The BipBop programme was launched in early 2009 due to the willingness of Schneider Electric’s president and CEO, Jean-Pascal Tricoire, to promote access to clean energy for those who need it the most . The first goals were to increase Corporate Social Responsibility in the many countries where the Group is present as well as to highlight its overall innovation capacity. The three pillars of the programme – Business, Innovation and People – are meant to address the issue of access to energy in a systemic approach: promoting the development of locally-based enterprises in the field of access to energy through an impact investment fund; spreading products and solutions that are adapted and dedicated for low income populations through a market creation approach; and contributing to the development of long-term competencies in energy management through adapted trainings. 30The progressive integration of the BipBop programme into the strategy of the Group is a major factor of success. Positioning itself as a solution provider permits it to address the energy needs of low-income communities. The programme incorporates a deeper business approach by gradually mobilizing different Business, Operation, and Support functions. These global and local actions permit to formalize a mainstream BoP strategy that balances standardization of models and adaptation to the local context. Nonetheless a multinational corporation does not have all the required capabilities. This is why inclusiveness of activities strongly relies on a combination of internal and external capabilities thanks to field partnerships. Finally, tracking social achievements of the programme through the Planet & Society Barometer – the Group’s sustainability scorecard – reaffirms the engagement of top management. These factors tend to promise BipBop a strong anchorage in worldwide strategies aiming at tackling basic access issues faced by low-income populations such as access to modern energy. 31This paper describes the Schneider Electric experience towards reconciling poverty eradication and protection of the environment. While BipBop is relatively young, its achievements illustrate the first criteria for a BoP strategy to become successful. Challenges still remain to reach that status. 32First, testifying relevance of activities toward development of populations may not be ensured through the Planet & Society Barometer itself. The social objective of the programme requires an enlarged measure of every social impact through the creation of a specific extra-financial accounting. The aims are twofold. A first objective is to internally monitor in depth the different social outcomes in order to improve the efficiency of its activities. An adaptation from the international donors’ Logical Framework seems to be a first step . A second objective is to evaluate broader social impacts, and validate them through external actors . This means proving the attribution of the activities of a BoP strategy towards “Positive and negative, primary and secondary long-term effects produced by a development intervention, directly or indirectly, intended or unintended” . Several approaches exist which are more or less stringent. We may use non-experimental techniques like the Progress out of Poverty Index (PPI) developed for the Grameen Foundation but which do not answer the specific issue of defining the causal link between activities and observed changes. On the opposite, experimental techniques like Randomized Control Trials promoted by Esther Duflo provide rigorous randomized analysis of social impacts but may be costly and inherentlydifficult to apply for a company. 33Secondly, attaining sustainability of models to grow in time is not necessarily dependent only on profit maximization, as advanced by Simanis . An extra-financial accounting would also lead to better understanding potential benefits of conducting such responsible programmes. Rather than just looking for direct profitability, the programme can improve brand and reputation, obtain licences to operate, attract and retain talents, represent a source of innovation for mature markets, or even constitute markets of tomorrow. Minna Halme discusses different types of Corporate Social Performance that may lead to improved financial performance . Extra-financial benefits constitutejust as manycriteria forsustainable growth of BoP strategies run by Multinational Corporations but need to be further evaluated. 34Thirdly, impacting as many people as possible through replication strongly relies on building unconventional alliances. In the company perspective, combining capabilities with cross-sector alliances on the field may be close to a business-to-business approach. However, partners in BoP strategies are generally non-profit organizations or social entrepreneurs, which have different objectives and organizational structures. As proposed by Murphy, Perrot and Rivera-Santos applying a “relational capacity for Social Innovation” (RCSI) model would improve understanding of learning and innovating dynamics of such partnerships. Missions of NGOs, social entrepreneurs, and multinationals are now converging on targeting social and environmental issues through the use of market-based approaches. Each of their historical perspectives influences the emergence of intermediate joint practices, reconciling poverty eradication and protection of the environment in an innovative way. 35The authors wish to thank Jean-Pierre Ponssard, and François Perrot from Ecole Polytechnique for their helpful support. We are particularly grateful to Sustainable Development Direction team members of Schneider Electric for their availability and insights. Financial support from the Ecole Polytechnique chair FDIR (chair for sustainable finance and responsible investment) is acknowledged. DfID. (2002). Energy for the Poor. Underpinning the Millennium Development Goals (pp. 32). London: Department for International Development. Duflo, E., & Kremer, M. (2003). Use of Randomization in the Evaluation of Development Effectiveness. Paper presented at the Conference on Evaluation and Development Effectiveness, Washington. Hammond, A. L., Karmer, W. J., Katz, R. S., Tran, J. T., & Walker, C. (2007). The Next 4 Billion. Market Size and Business Strategy at the Base of the Pyramid (pp. 164). Washington: World Ressources Institute, International Finance Corporation. Heuraux, C. (2010). Access to Energy in Developping Countries: EDF's Experience with Rural Electrification Using an Innovative Business Model. In P. Crifo & J.-P. Ponssard (Eds. ), Corporate Social Responsibility: From Compliance to Opportunity? (pp. 19). Palaiseau: Ecole Polytechnique. IEA. (2011). Energy for all. Financing access for the poor. In OECD/IEA (Ed. ), Special early excerpt of the World Energy Outlook (pp. 52). Paris. Karnani, A. G. (2007). Fortune at the Bottom of the Pyramid: A Mirage. Ross School of Business Paper, 1035, 42. OECD. (2002). Evaluation and Aid Effectiveness No. 6 - Glossary of Key Terms in Evaluation and Results Based Management (in English, French and Spanish): OECD Publishing. Olsen, S., & Galimidi, B. (2008). Catalog of Approaches to Impact Measurement. Assessing Social Impact in Private Ventures (pp. 72): Social Venture Technology Group. Perrot, F. (2010). Corporate Strategies and the Construction of Markets at the Base of the Pyramid. In P. Crifo & J.-P. Ponssard (Eds. ), Corporate Social Responsibility: From Compliance to opportunity? (pp. 233-253): Les Editions de l'Ecole Polytechnique. Porter, M., & Kramer, M. (2011). Creating Shared value. How to reinvent capitalism and unleash a wave of innovation and growth. Harvard Business Review, 17. Prahalad, C. K., & Fruehauf, H. (2004). The fortune at the bottom of the pyramid: Eradicating Poverty Through Profit: Wharton School Publishing. Schneider-Electric. (2009). Rapport d’activité et de développement durable 2008-2009 (pp. 44): Schneider Electric. Schneider-Electric. (2011). Strategy & Sustainable Development Report 2010-2011 (pp. 84): Schneider Electric. Simanis, E., & Milstein, M. (2012). Back to Business Fundamentals: Making BoP Relevant to Core Business. Field Actions Science Report(Special Issue 4), 8. Sireau, N. (2011). Microfranchising: How Social Entrepreneurs are Building a New Road to Development: Greenleaf Publishing. WBCSD. (2012). Business Solutions to Enable Energy Access for All (pp. 40). Geneva: World Business Council for Sustainable Development. Yunus, M. (2008). Creating a World Without Poverty: Social Business and the Future of Capitalism: PublicAffairs.